Ringer Lissuin provides a translation of the Aftonbladet article about the self-sufficient Hobbit village planned for Stockholm in Sweden. An entire village from The Lord of the Rings is going to be built — on Musk Island. Soon you’ll be able to live like Bilbo in Stockholm’s archipelago. The Lord of the Rings village will entice stressed-out city dwellers to live under the ground. Behind the earthen-hole village in Stockholm’s archipelago are John Higson and Marie Eriksson. 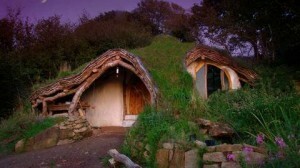 The idea was born when they heard stories of a British man, Simon Dale, who had just finished his first hobbit house — inspired by Lord of the Rings — in a forest in Wales. When they later bought Arbottna Satteri on Musk Island, they realised that Sweden’s first hobbit village would fit in perfectly. “For many years it was a dream, but no one could visualise it”, says Marie Eriksson. Simon Dale came to Musk Island to help with the planning and design. He himself has lived in a hobbit house for eight years and sees only the advantages to a partly subterranean life. “The only disadvantage is that I don’t want to leave it,” he says. The houses on Musk Island will be adapted to each owner’s specific needs, and the owners will participate in building their houses. All building material will be natural and from what is available in the local area, which will result in houses made of straw bales, logs and clay. The plan is to build 10 to 15 houses, and John Higson hopes to see the entire hobbit village be self-supporting with its own brewery, dairy and bakery.